Peer-to-peer lending has been around here in the United States for the better half of a decade. This type of lending environment strives to bring both individual and institutional investors together with various grades of qualifying borrowers. The two main companies in the peer-to-peer lending arena are Lending Club and Prosper with both having over five years of lending history. Since inception, these two loan facilitators have seen tremendous growth and change as they have developed and created an entire market for this type of lending. After considering an investment with Prosper for a couple of years, I finally pulled the trigger at the end of May 2013 and opened a taxable account with an initial investment of $1,000. Prior to making my investment however, I spent many hours playing with various borrower criteria and developed my own criteria for investing (2013) with Prosper. I have since modified my original criteria and will be using this one for 2014. Some of the highlights of my criteria is focusing on only 36 month loans with a rating of C or lower. Below you will find the most recent summary of my Prosper account. If you’re interested the progress of my two Lending Club accounts, please check out the details on my Lending Club page. 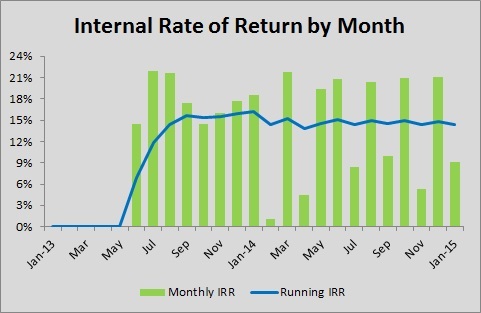 In the table above you can see I am tracking my internal rate of return calculated by using Excel’s XIRR function and the return number provided by Prosper. There is a difference between these two numbers as a result of the cash drag experienced while waiting for notes matching my investment criteria becomes available. The return number provided by Prosper does not account for this idle cash. 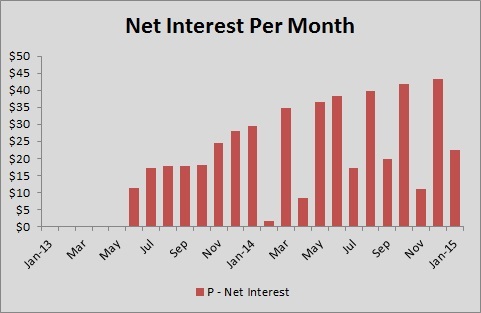 Also included in the chart above is the period net interest, in this case the monthly amount, followed by the amount received over the previous 12 months, or trailing 12-months (TTM). While insignificant now, as this account ages, one will be able to see how trailing interest figure grows, demonstrating an ability for this account to compound and one day produce income to supplement my retirement without touching the principal. Net interest is calculated by taking the interest earned less any charge-offs, defaults, and service fees in the given period. In addition to showing my monthly net interest in the table above, I’ve added the chart below to provide a visual demonstration of my progress. I am excited to have added Prosper to my peer-to-peer lending portfolio, and plan on growing this account and eventually opening an IRA account sometime in the next year or two. If you have any questions about investing with Prosper, or peer-to-peer lending, please let me know via my contact page or the comments below. We just opened a Prosper account for my wife, and she has about 15 notes now. We are buying A, B, and C notes in this account to see how it performs. So far, so good! We set up a nice auto-buy filter and that has worked very well keeping her free cash invested. We will drop more money in this account as we see how it performs over time. Sounds good Ray. I would encourage you to try and get 100 or so notes in the account to provide an appropriate level of diversification. With just 15 notes, one default can wipe our your gains pretty quickly. Keep up the sound investing! I have been in Prosper for over a year now averaging about 11% using A,B,C with a few D notes. Out of 570 notes, I have had four defaults. By adding $100 a month (sometimes more), my $10,000 account (January 2014) is just about $15,000 (Nov 2014). By using a filter system, it takes me about five minutes a day to select new loans. That’s the key…have everything on automatic so time involvement amounts to a few minutes each day. I am very impressed with this system and compare it to my Dividend Stock portfolio comprised of high paying dividends under REITS, MLP’s, and BDC’s. They also average about 11%. (The stock path is so much easier, as I have primarily monthly payouts with no fuss. More volatility but less work. Just requires an iron stomach when prices go up and down, such as the oil and gas stocks at the present time which I own (LNCO and ARP). I love the 14-15% monthly dividends as a retiree. I could care less about the price as long as they keep paying out a dividend. Prosper primarily serves as investment diversification into five different buckets in case one or more of our investments hit the fan, like in 2008-2009. We have most of our money in IBonds invested since 2001. Steady, guaranteed, no worry, no fuss 5% a year, for 30 years. If inflation increases, the bond return increases as well. Too bad the rates are so low today that it doesn’t make sense to own new ones. I would certainly am an advocate of automating investments, and Prosper is no different. Good to hear you’re having success with your investments thus far. Personally, I view P2P lending as a type of fixed income, as opposed to BDCs or high-paying dividend stocks. With the high yielding stocks, you have the risk of the dividend getting cut, and there have been plenty of examples of that happening. Certainly only you and your wife can truly evaluate your risk tolerance and the associated allocation of investments required to meet your income goals. Those IBonds sounds pretty fantastic, especially in this low interest rate environment. Congratulations on completing the journey and enjoying the fruits of your savings and investments. Must have been a wonderful past 15 years as you traveled the world! Thanks for reading and sharing your thoughts. As an update for year end tally, I made a total interest of $1507 based on total investment of $13,500 deposited over 12 months to Prosper. That’s about 11.16% return with five defaults out of 603 loans. Pretty incredible! Prosper is so much more stable than the stock market. It is a great tool for diversification as I said above. Compare this to 0.85% return in our savings account. Prosper is indeed a nice solution for those looking to boost their returns on cash sitting in savings accounts earning less than inflation. Based on what you’ve said you have a fairly young portfolio with Prosper. I wish you continued success as your portfolio ages and your returns stabilize. Comparing to the stock market isn’t really apples to apples as there are completely different types of risks involved. I would agree, however, that P2P is a nice place to gain some asset allocation diversification while creating a solid stream of passive income.